I walk along the beach at least a couple of times a week all year long. It doesn't matter to me whether it is spring, summer, fall or winter. I actually prefer the off-seasons when there are fewer people around. The beach at those times is the perfect place to go to be alone with one's thoughts. Even though I usually walk the same stretch of beach it seems that the view is never the same. The ocean seems to have an ever changing personality. Some days it is bright and cheerful and other days it rages. The beach, as well, changes daily. One day it will looks smooth and pristine while the next day it will be covered in ruts and mounds of rock. 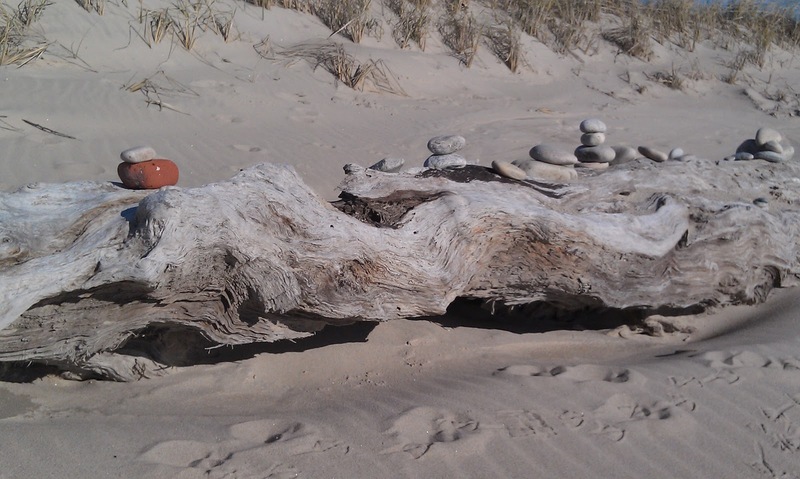 Occasionally I find that some creative person has left his or her mark with a delightful beach sculpture. I always stop to admire the work and wonder what the artist was thinking. Was it kids whiling away their day? 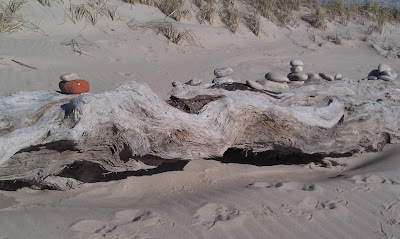 Or, was the artist rejoicing in the rocks and driftwood offered by the tides? Whatever the reason, I am delighted by the surprise. Beautiful...I wished we lived closer, I love walking the beach as well but no one here likes to walk on our cold and windy beaches! I know what you mean, Quiltingranny. Once in a while I can convince someone to go with me, but I'm usually walking alone. It's their loss.